Stephen Bloom, a journalism professor at the University of Iowa, created quite a stir in Iowa this week with a piece in The Atlantic describing his unique observations on rural Iowa as evidence that it doesn’t deserve its decidedly powerful hand in the vote for the president. After the article appeared last Friday both his colleagues and the massive student body of the state he so harshly criticizes are returning the favor. Mr. Bloom’s writing is not offensive because it contains no truths, but because has over-generalized our collective character as unfalteringly Christian, complacent, ignorant, and uncultured. He continually describes a sense of delusion that is rampant in the Iowa populace. And, of course, since we’re from Iowa we must have met a meth head before, right? When I was a four year old, my parents picked up everything they had and transplanted their lives from Phoenix all the way to Northwest Iowa. I was young, but I can still remember the farm that we originally settled in-- it was the kind of farm you see in a painting: a one-level home, a big red barn, two silos for storage, a small thicket grove with a number of deer, and even a fenced-in area for hogs. I was living the rural Iowa dream. Eventually, when I was around seven, our next settlement of choice was a (very) small town only a couple of miles from the farmhouse. The city’s population had around 200 people, the vast majority of them at least 50 years old, and a main street littered with old buildings and storefronts of yesterday that had been abandoned over the years since their mid-century inceptions. People didn’t move to this town; instead those living in it would die from old age, or, in my case, move away in hopes of seeing something bigger. I’m well aware of the stereotypes of Iowans: we’re wannabe hicks, we’re uncultured, we hunt, we tend to our rolling hills of corn and beans, we all drive Ford trucks because they “ride better” than anything else. I’ve grown up with people that fulfill these stereotypes here and there and I am no stranger to small town life, but not every soul that I have met in this state fits the profile as Professor Bloom posits. Far from it. Yesterday, Sally Mason, the president of the University of Iowa, sent out a campus-wide letter reminding the students that she “disagrees strongly with and was offended by Professor Bloom’s portrayal of Iowa and Iowans”. She reminds us of the generosity that Iowans famously possess and of our “pragmatic and balanced” lifestyles. She also goes on to speak about Dubuque’s recent revitalization, the kinds of companies Iowa has attracted (namely Rockwell Collins in Cedar Rapids and Google in Council Bluffs), and the fact that Iowa City, at times called the “Athens of the Midwest”, is designated as the only “City of Literature” in the United States. It seems like Bloom forgot to take any of this into account. He even goes so far as to berate and categorize Iowa’s Mississippi River cities as “some of the skuzziest cities” that he’s ever visited. Cities such as Burlington, Keokuk, Muscatine, and Davenport all seem to be more degraded, violent, and worse-off than some of the cities he’s used to having seen growing up in New Jersey, a place with cities that are labeled time and time again for their overall “skuzziness.” Has he ever driven to Newark? It seems that Bloom’s laughable interpretation of his years in Iowa have a few rings of truth that I’ve definitely witnessed, but to completely overgeneralize a people into one category assuming it’s only an “Iowa thing” is inappropriate and crude. Is he correct about anything at all? The numbers show that he is off base about the state as a whole. The Mississippi River cities’ so-called blight is similar to many other hard hit industrial cities in the Midwest, perhaps on a similar scale to areas in Michigan (which was the only state in the past Census to actually lose population) where Bloom has holed up most recently as a visiting professor for the University of Michigan. Even so, Iowa has the 11th lowest household poverty rate in the nation. So much for widespread blight. The state’s brain drain is always a topic of discussion. There has been a very noticeable population shift of rural to urban in the past half-century which was especially fueled by the farming crisis in the 80s, but this trend holds out empirically for all Midwestern states. The problem is that a look at the numbers doesn’t confirm major outmigration. 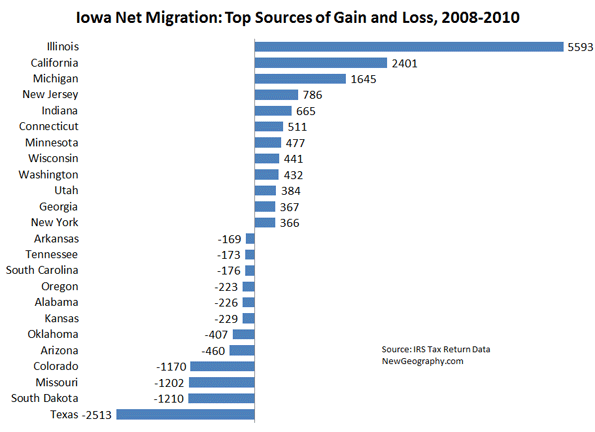 Iowa saw a net gain from other states according to IRS tax return data from 2008-2010. In fact, the net gain from the top 12 source states ­­– states like Illinois, California, and Michigan – in the last three years is 40% higher than the net loss to the top destinations. If Iowans are “fleeing” anywhere, it’s to places like Texas, the largest gainer, and second placed South Dakota which the professor would no doubt like even less. 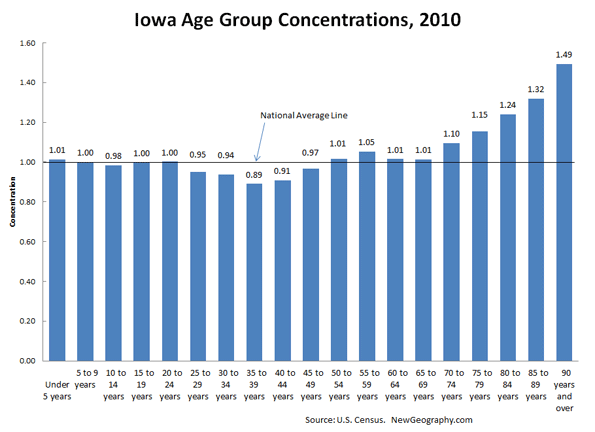 Iowa does have high concentrations of people over age 70, but that group makes up about 10% of the total population, not enough to skew the other age groups much from the national average. Iowa has an average number of children, and it lags the most in 35-44 year olds: about 10%. This older group skews the state’s educational attainment numbers as well. Iowa’s young workforce is well educated, ranking 11th of all states in residents with at least an associate’s degree. Bloom’s claim that the state is uneducated is simply not true. The median age of those living in rural areas is 41.2 while urbanites are relatively young at 35.8. To further add to these negative trends, rural areas have a job growth rate of -6% in the past three years, these numbers mainly fueled by the recession. But overall state jobs are is down 2.8% since January 2008, better than 35 other states. Clearly Iowans are not lazy and giving up. 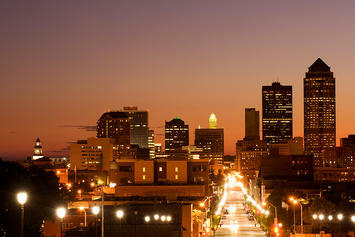 Four Iowa cities were even included on CNN Money’s Best Cities to Live in 2011. (This includes the Mississippi River city of Bettendorf.) The state and its cities are also a great place to do business, according to Forbes. In 2010, Des Moines was ranked first, with Cedar Rapids at 13th beating out even a few Texan heavyweights, including Houston, Dallas, and Fort Worth that have been lauded for having a plethora of jobs. The 2011 list puts Des Moines in second place and Cedar Rapids in 11th. It seems Iowa isn’t as economically distraught as Bloom leads us to believe. Bloom comes off as nothing more than an ignorant, smug “city-slicker” (a word that Iowans apparently use to describe Obama) who sees the state through an apparently very blurry window. He claims to have seen all 99 counties of Iowa, but how can he possibly paint a portrait of the state that is so absurdly misguided after living here for so long? If this is what they teach in journalism school, perhaps our skepticism of the media may be better placed than even we suspect. Jacob Langenfeld is a senior undergraduate at the University of Iowa studying economics and geography. Mark Schill contributed demographic analysis to this piece. Des Moines photo courtesty of BigStockPhoto.com.